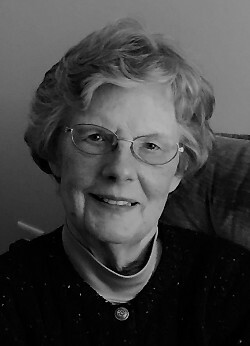 Westbrook, ME - Mary Sue Gould, 86, of Westbrook, died peacefully with her daughters by her side on Mother’s Day, May 13, 2018 after a courageous battle with cancer. Mary Sue was born on January 11, 1932 in Philadelphia, PA. She was the daughter of Dorothy Catherine Young and Norman Randolph Harris. She graduated from Bridgeton, NJ in 1949 and from Temple University School of Dental Hygiene in 1951. She worked as a dental hygienist and later became household executive and stay at home mom for her three children. While living in Skowhegan, Mary Sue enjoyed being a long-time member of the Lakewood Golf Club. She volunteered at the local hospital, worked at the food cupboard, sang in the choir and served on various boards at the Federated Church. While living in Windham, she was a member of the N. Windham Union Church, UCC, where she proudly managed the thrift shop for many years. Her hobbies included fitness, golf, knitting, gardening, sewing, and travel; she loved to dance and “boogie” to her favorite disco songs. Mary Sue was an avid Red Sox fan and she never missed an episode of her favorite TV show “Jeopardy”. Mary Sue was predeceased by her parents, Norman and Dorothy Harris, her sister, Norma Jo Clunan, and her son, Robert H. Gould. She is survived by her daughters Linda G. Nickerson (Richard) and Lisa A. Seymour (John Knightly), of Windham, her grandchildren, Benjamin Toppi, Laura Toppi and Kathryn Seymour; step-grandchildren, Jason Seymour (Heather), Amanda Doyle (Scott), and Cameron Seymour (Kelsey), Arianna and Sarah Nickerson; and four step-great-grandchildren; nieces Jamie Lynn Goodwin (Billy) and Jackie Rushing, and nephew Randy Clunan. A Celebration of Life for Mary Sue will take place on Sunday, June 3rd at 12:30 at the N. Windham Union Church, UCC at 723 Roosevelt Trail, Windham, Maine. In lieu of flowers donations can be made to Good Shephard Food Bank, Lupus Foundation of American or Arthritis Foundation.